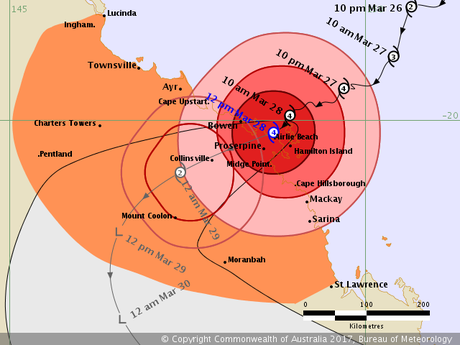 Cyclone Debbie (Category 4) is making landfall. More than 20,000 without power through Mackay, Whitsundays. CYCLONE Debbie has made landfall between Bowen and Airlie Beach, after smashing Hamilton Island. Watch: Cyclone Debbie lashes Whitsundays: High winds and rain have hit Hamilton Island. Those between Ayr and St Lawrence are specifically being warned about the treat of a storm tide as the cyclone crosses the coast. The sea is likely to rise "significantly above the normal tide", flooding low-lying areas. Some areas are expected to receive up to 500mm of rain in a 24-hour period, while others will receive closer to 200mm. Cyclone Debbie from space: The ISS gives a view of the size of Cyclone Debbie from space. WIND gusts close to 200kmh are smashing Whitsunday islands, with those sheltering on the tropical getaway describing the screams of Cyclone Debbie as "freight trains coming through". 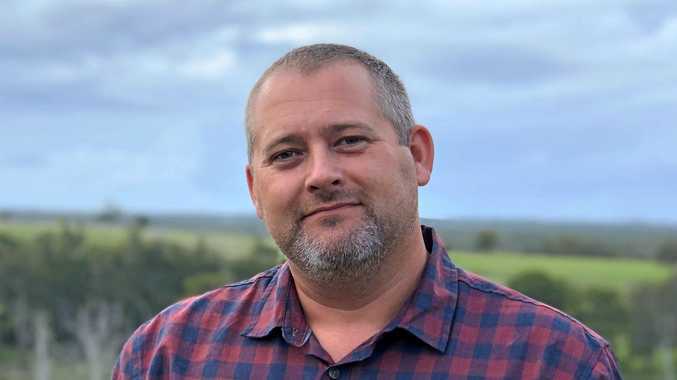 The storm system is now tracking towards Bowen, with emergency services and Mackay Mayor Greg Williamson hoping that might reduce the impact on his town, even slightly. But he was cautious early this morning, telling ABC Tropical North that nothing is certain in relation to Cyclone Debbie. "How many times has it changed so far?" he said. "We're not out of the woods yet. "There's nothing we can do at this stage except ride it out." He told ABC Mornings that Mackay is "right on the gale force edge" of this system. Mackay is yet to open evacuation centres -- they will be open after the event, the mayor says. "We don't want people in a building that can't withstand a category five cyclone." MORE than 20,000 homes across Mackay and the Whitsunday regions are without power, as Cyclone Debbie prepares to strike land in coming hours. It is now due to make landfall at 1pm. Overnight the very destructive cyclone was upgraded to a Category Four system. Earlier this morning the Bureau of Meteorology estimated the storm would deliver wind gusts of up to 260kmh. In its 5am bulletin, the Bureau of Meteorology warned that destructive wind gusts topping 125kmh were now striking the Whitsunday Islands, and would soon reach areas between Ayr and Sarina. A dangerous storm tide is still likely, with the BOM warning the sea could rise "significantly above the normal tide" and deliver damaging waves and flood low-lying areas. Up to 500mm of rain could fall in just 24 hours in some areas, although most would receive closer to 200mm. As of 5.50am, Ergon Energy was reporting that 20,613 sites were without power through Mackay and to the north. Of those, 10,289 sites were in Mackay, with parts of North Mackay, Sarina, Hay Point, Alligator Creek, Koumala, Calen, Eungella, Finch Hatton, Mirani being plunged into darkness. Another 10,324 homes and businesses through the Whitsundays have also had their power knocked out, particularly in Airlie Beach and Cannonvale. Another 485 homes are without power in the Isaac Region.